In this sobering poem, Chechnya-born Greek poet Jazra Khaleed vividly depicts a war “so trite and pedestrian, filled with similes and ornate adjectives, its history is written in the font Comic Sans.” For most of us in the settled world unable to imagine what it is that Syrian refugees go through, these words encompass a different but now less unknowable spectrum of the human experience. On the 7th of January 2014, the United Nations stopped counting Syria’s dead. This decision certified mathematics as the science of quality, not quantity, of living labor, not shapes, of time, not space—in other words, mathematics is the science that studies the material relations among all countable objects. I, Ahmed, son of Aisha, although nothing more than a humble migrant, wish to apologize on behalf of the Syrians to Greek men and women for filling their televisions with our deaths as they eat their dinners and wait for their favorite shows, I wish to apologize to the municipal authorities for leaving our trash on their beaches and polluting their shores with tons of plastic, we are uncivilized and we have no environmental awareness, I wish to apologize to the hotel owners and tour operators for damaging the island tourist industry, I wish to apologize for shattering the stereotype of the miserable migrant with our mobile phones and clean clothes, I wish to apologize to the coast guard who have the thankless task of sinking our boats, to the police for standing in disorderly lines, to the bus drivers who have to wear surgical masks to protect themselves from the diseases we carry, I also wish to make a most humble apology to Greek society for exceeding the capacity of their detention camps and for sleeping in their squares and parks—finally, I wish to apologize to the Greek government who had to request additional funds from the European Union in order to pay the purveyors who stock the detention camps, as well as the bus drivers, the police, the coast guard, the tour operators, the hotel owners, the municipal authorities, and the television stations. “Don’t worry,” said the bullet, “I’ll go in and out.” I explained to her that I couldn’t allow it since when she left she was bound to take some of my memories—like the face of the girl I loved in the fifth grade, the voice of the imam the first time my father took me to pray, the smell of the freshly baked bread in my grandmother’s house, the fingers of my teacher as she taught me to write the word الحرب and Van Basten’s final goal in the Euro of ’88. 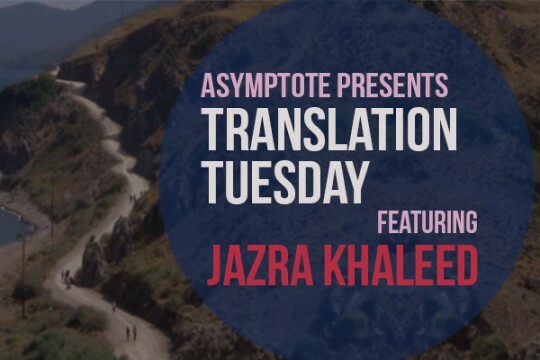 Jazra Khaleed (Born Chechnya, 1979) lives in Athens, writes exclusively in Greek, and is known as a poet, editor, and translator. His works are protests against the injustices in contemporary Greece, especially the growing xenophobia and racism. His poems have been widely translated for publications in Europe, the US, Australia, and Japan. As a founding co-editor of the poetry magazine Teflon, and particularly through his own translations published there, he has introduced the works of Amiri Baraka, Keston Sutherland, Etel Adnan, and many other political and experimental poets to a Greek readership. His debut collection Grozny was published in spring 2016, while his newest short film “Gone is Syria, Gone” has been selected for the Internationale Kurzfilmtage Winterthur, the Kasseler Dokfest, and L’Alternativa . His poetry blog can be found at jazrakhaleed.blogspot.gr. Karen Van Dyck is Professor of Modern Greek Literature in the Classics Department at Columbia University. She writes and teaches on issues of gender, diaspora, and translation. Her books include Kassandra and the Censors (Cornell, 1998), The Rehearsal of Misunderstanding (Wesleyan, 1998), The Greek Poets: Homer to the Present (Norton, 2009), and The Scattered Papers of Penelope: New and Selected Poems by Katerina Anghelaki-Rooke (Graywolf, 2009). Her bilingual anthology Austerity Measures: The New Greek Poetry (Penguin, 2016), a New Statesman Book of the Year pick, will be published by the NYRB in the US in March. She discusses the anthology as well as this new poem by Jazra Khaleed in her essay “What’s Found in Translation” (forthcoming, PN Review 234).